This is the Sleepy Hollow edition of the Imperial Gunner figure. 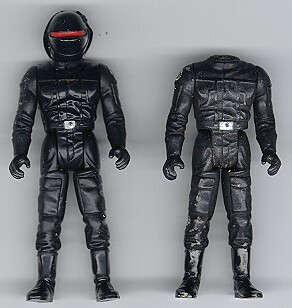 Actually, the figure that is unfortunately missing its head is an internal first shot of the Imperial Gunner figure. It was probably made prior to the time at which mass-production on the POTF line had begun, and it was probably used as a model for photography or some industry show. The material it is made from is a low-quality, milky-colored plastic, and it is fully painted. Unlike regular production figures, the torso is not composed of two separate halves which have been sonic-welded together; rather, the torso is a solid piece, into which the limbs are inserted via plastic pegs. It doesn't look like much in the photo, but these internal first shots are pretty desirable to prototype collectors. The only real differences in the detailing occur at the shoulders, where the Imperial insignia have obviously been hand painted, and on the boots, which are painted in a glossier black than they are on the production figure.